Russian state television has broadcast a map of the US showing military facilities Moscow would target in the event of a nuclear strike, in a report that was unusual even by its own bellicose standards. The Targets included the Pentagon and the Presidential Retreat in Camp David, Maryland. 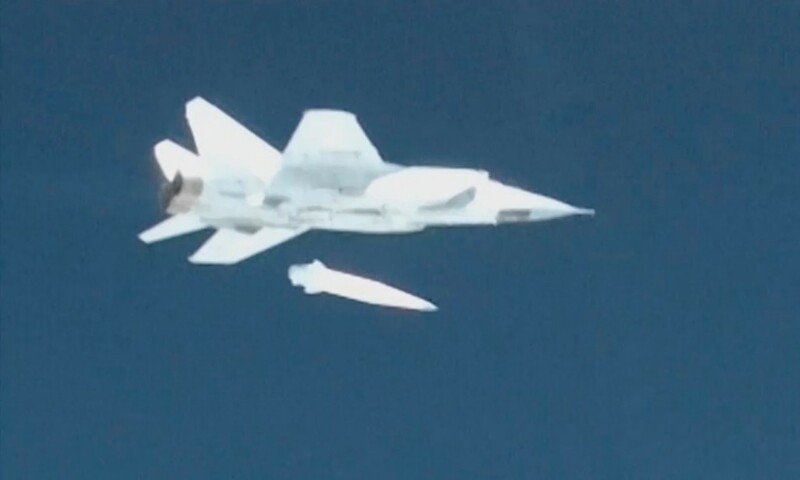 A Hypersonic Missile Russia is developing would be able to hit them in less than five minutes, it said. Last week, Vladimir Putin said Moscow was Militarily ready for a “Cuban Missile-Style” Crisis if the US wanted one. With tensions rising over Russian fears that the US might deploy intermediate-range nuclear missiles in Europe as a cold war-era arms-control treaty unravels, Putin has said Russia would be forced to respond by placing hypersonic nuclear missiles on submarines near US waters. The US said it had no immediate plans to deploy such Missiles in Europe and dismissed Putin’s warnings as Disingenuous Propaganda. It does not currently have ground-based Intermediate-Range Nuclear Missiles that it could place in Europe. However, its Decision to quit the 1987 Intermediate-Range Nuclear Forces (INF) Treaty over an alleged Russian Violation, which Moscow denies, has freed it to start Developing and Deploying such Missiles. Putin has said Russia does not want a new arms race, but he has dialled up his military rhetoric. Some Analysts have seen his approach as a Tactic to try to re-engage the US in talks about the Strategic Balance between the two Powers, which Moscow has long pushed for, with mixed results. In the Sunday evening broadcast, Dmitry Kiselyov, the presenter of Russia’s main weekly TV news programme, Vesti Nedeli, showed a map of the US and identified several targets he said Moscow would want to hit in the event of a nuclear war. The targets, which Kiselyov described as US presidential or military command centres, also included Fort Ritchie, a military training centre in Maryland closed in 1998, McClellan air force base in California, which closed in 2001, and Jim Creek, a naval communications base in Washington state. Kiselyov, who is close to the Kremlin, said the Tsirkon Hypersonic Missile that Russia was developing could reach their Targets in less than five Minutes if launched from Russian Submarines. Hypersonic Flight is generally taken to mean travelling through the Atmosphere at more than five times the speed of sound. “For now, we’re not threatening Anyone, but if such a Deployment takes place, our response will be Instant,” he said. Kiselyov is one of the main conduits of State Television’s strongly Anti-American tone, once saying Moscow could turn the US into Radioactive Ash. Asked to comment on Kiselyov’s report, the Kremlin said on Monday it did not interfere in State TV’s Editorial Policy.